These recipe for chili stuffed burritos is one of my favorite Mexican cooking recipes that I love, using homemade chili con carne makes for a quick and easy dinner. Great for those busy days. Serve with a Mexican Salad or the Corn Bean Dip. Make the Salsa ahead of time and store in the refrigerator until ready to assemble the chili stuffed burritos. Prepare the Salsa. Combine tomatoes, onions, chilies, cilantro, salt and coriander in a small bowl. Cover and chill until serving time. Heat your prepared chili, bringing to a boil. Lower heat and simmer, uncovered to reduce liquid. Mixture should be fairly stiff but moist. 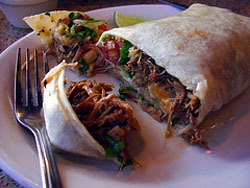 For each burrito heat tortilla on large non-stick skillet or griddle until soft and pliable. Spread 1/2 of the chili over lower third of the tortilla in a band about 4 x 1 inch wide. Work quickly so the tortilla does not get crisp. Top with about a tablespoons of each guacamole and salsa, sprinkle with cheese. Fold bottom edge over filling. Bring sides toward center over filling and roll. Eat as is holding like a hot dog or place on a plate and serve with rice and re-fried beans. You can garnish with a spoonful of sour cream, shredded Cheddar Cheese and Guacamole Dip on top. Please let your friends know about us by clicking the "Like" button.